Is space for wonder or for war? - Helen Caldicott, M.D. Is space for wonder or for war? “What country is that?” asked Congressman Elijah Cummings on Tuesday, outrage choking his voice with emotion. Cummings, a Congressman from Maryland, could have been asking his question about any number of policies. In this case it was about the internment of children at the US border. But it applies almost universally. And certainly to the prospect of provoking, even encouraging, war in space. But that’s also what the Trump administration is now doing. “Space is a warfighting domain,” said the White House statement this week. It came as the Trump administration once again proclaimed that it plans to create a “Space Force.” What country is that? Last time the Trump White House tried this, Pentagon officials objected, saying it would “lead to unnecessary costs and bureaucracy.” Maybe. What’s far far worse is that it would lead to unnecessary wars. Have we lost all reason? Are we supposed, now, to lose all hope as well? Space is for wonder. It’s where we live. We are a small dot in the midst of enormity, floating in a dark vastness about which we know a surprising amount, and yet with so much more still mysteriously unknown. We used to be able to gaze up into space and pretend to count the infinitesimal stars. Now, cloaked in the haze of light pollution, we actually can — maybe a dozen or so on a non-cloudy night for those of us who live in cities. We have lost our perspective, our sense of where we fit in the universe. Light pollution is a tragedy that has allowed us to forget who we are. It has drawn a veil over the most wondrous and imponderable thing in our existence. Space as a warfighting domain is the latest obscenity in a long list of vile actions by a vile administration. We know what they are. ProPublica played us the soundtrack of one of them this week. That makes the 2018 midterm elections even more critically important because the Republicans in Congress seem all too easily suggestible to Trump’s every evil move, and no, this is not an over-statement. Pulling out of the Paris Climate Accord and disavowing climate change (while deliberately promoting greater fossil fuel use) is an act of evil, toward everyone on Earth. Withdrawing from, and potentially destroying the Iran nuclear agreement is an act of evil — it could lead to a nuclear war, combusted in the Middle East but which would inevitably spread across the world. Separating already traumatized children from their parents is evil. “The US has gone mad,” said Dr. Helen Caldicott, godmother of the anti-nuclear movement who wrote a book on the subject of space conflict — War in Heaven. Caldicott is not known for mincing words, and now is not the time to mince them. It is time to call out wrong in the most urgent way possible, as Cummings did. 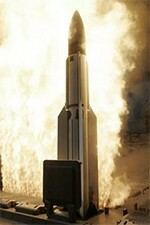 “With 800 bases in 70 countries; the biggest exporter of weapons to the world; involved in numerous wars around the world; about to spend $1.7 trillion replacing every single nuclear weapon and delivery system over 30 years; and now plans to fight war in space — the US certainly is the number one killing nation in the world,” Caldicott said. A Space Force is not an aspiration unique to Trump megalomania, of course, but it feels worse in his reckless hands. And it isworse because of the tacit acceptance the plan has received, as if it is just a natural extension of bellicosity on Earth, an inevitable boys-will-be-boys toy. Not content to make large parts of our world a living hell (Syria, Yemen, South Sudan, Palestine, Congo…the list goes on), now we want to cast fear and terror into the heavens as well. And this aspiration is cloaked in ominous rhetoric. Trump says America “must have dominance in space.” He is a Bond villain with the nuclear button. A Space Force is not about GPS and weather satellites, despite what military spokesmen might say. Or even about spying. It’s about preparation for war. And that war will include nuclear weapons. If we fight wars— and especially nuclear wars — in space, we are finished as a species. What’s most worrying about all the attention this has garnered is that the objections expressed have been all about cost and bureaucracy and disrupting the smooth-flowing operations of the Air Force. Where is the moral voice here? It is our nuclear sword of Damocles. We can let it fall, or we can chop it down.